Bike storage can be a hassle in small spaces. It’s bad enough that you have this big rectangle; but then you have handlebars and pedals jutting out, ready to snag a passerby. And while easy-to-stash foldable bikes are great, sometimes our riding habits and preferences demand a full size frame and wheels. To solve this issue, LifeEdited founder Graham Hill put this “ThinBike” together with German company Schindelhauer. The bike features fold-up pedals by MKS and a quick release stem by Speedlifter that allow you to put the bars flush with the rest of the frame. All this allows the bike to go from a portly 21″ width, to a mere 6″. While the $1800 package that Graham put together–replete with Gates Carbon Belt Drive and white rims to match the white tires–might be a bit steep for many, retrofitting your current bike with the stem and pedals can be done for about $200. You should really paint this thing. 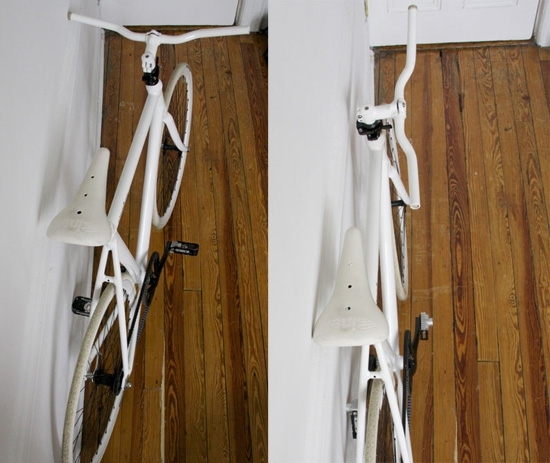 Nice idea, ghost bikes, but to say you should paint this bike because they are all white too is as stupid as saying buildings should not have all polished stone finished foyers because most gravestones are made of the same material and color.